A Craigslist post advertising bundles of Modern Warfare 2 has led private investigators to arrests of thieves and pirates. 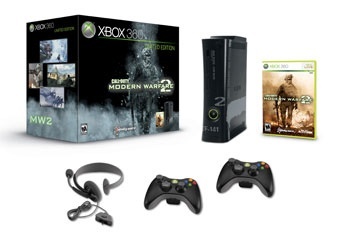 On October 29, someone posted an ad selling the Modern Warfare 2 bundle of console and game for $500, over ten days before the game officially comes out. Activision Blizzard spotted the ad on Craigslist and called in IPCybercrime.com, a Dallas P.I. firm, to track down the sellers. Through a series of undercover calls to the number listed, IPCybercrime nabbed the seller, but not before he completed a few transactions. One of the buyers was found to be an Xbox modder, who was later tracked down in Miami, Fl, poised to sell thousands of pirated copies of Modern Warfare 2. The pirate is now in custody. It was quite a week for Rob Holmes, owner of IPCybercrime, which lives up to its moniker by concentrating in online investigations. "It all happened very fast," he said. "If these guys get their stuff out, then they can do some major damage to sales and spoil it for everybody. We plug leaks every day, but this was one of the biggest ones of the year." The initial seller was found to be a kid who worked in the warehouse of a major retailer and somehow squirreled away a crate of the MW2 bundles without his supervisor catching wind of the theft. When IPCybercrime called posing as buyers, the perp quickly gave out an address and was seized without incident. I can only assume that he was a minor because his name wasn't leaked and he was transferred to the loss prevention divsion of the retailer instead of being arrested outright. Reaching the pirate took a little more doing, but honestly these guys are not super hard to find if you are looking in the right place. Interest was piqued first when Activision Blizzard saw a post by "cedelamo" on xbox360iso.com asking for donations so that he could buy the bundle posted above and crack it. IPCybercrime decided to search Facebook for the email address listed and they found a page offering modding services and a phone number. Calling the number, and again posing as a customer, agents were able to get a business address belonging to a computer store owned by Hiram Del Amo. The investigators went to the address and determined that the pirate was 18-year-old Christian Del Amo, who was set to make a killing with pirated MW2 discs printed with the real artwork and a hologram to appear legit. Rob Holmes then called in the Miami-Dade police department, who made the arrest. The bad news is that even though IPCybercrime worked quickly, pirates can work even quicker. It is assumed that Del Amo, posting as cedelamo, claimed that he cracked the game on Monday. Not so coincidentally, a pirated Modern Warfare 2 saturated torrent sites on the same day, potentially costing Activision Blizzard millions. The good news is that for once, authorites might have actually caught the guy who did it.